In spite of what their sessile lifestyle could suggest, or maybe perhaps as a consequence of it, plants appear to be big decision-makers. Developmental decisions such as dormancy/germination, growth/arrest, branching/suppression-of-branches, vegetative-growth/flowering, senescence, fate … are key factors for their survival and reproductive success. Clearly, messengers are crucial to take action in a coordinated manner, and therefore the central role that plant hormones play in this coordination is no wonder. Among plant hormones, and among decisions too, a strong connection can be made between those that involve fate determination or life cycle transitions and gibberellins (GAs). The role of GAs in organ growth, cell differentiation and flowering promoting pathways has been well established and, somehow, GAs can be viewed as ‘coaches’ towards a grown-up stage. Arabidopsis thaliana is an annual species that forms a vegetative rosette before entering into the reproductive phase. Flowering involves the bolting of the stem, which bears a small number of cauline leaves with axillary inflorescences, and above these the flowers grow. This particular type of growth, where in the bolting stem two different zones can be easily delimited, has led to two contrasting models to explain flowering transition, each of them based on different experimental evidence (Figure 1). The acropetal model proposes that the shoot apical meristem undergoes two consecutive transitions: at bolting, the vegetative (V) meristem takes a first-phase-inflorescence identity (I1) and laterally produces leaves subtending flowering branches before undergoing a second phase change, where the I1 becomes an I2 meristem that directly produces flowers (Ratcliffe et al., 1998). 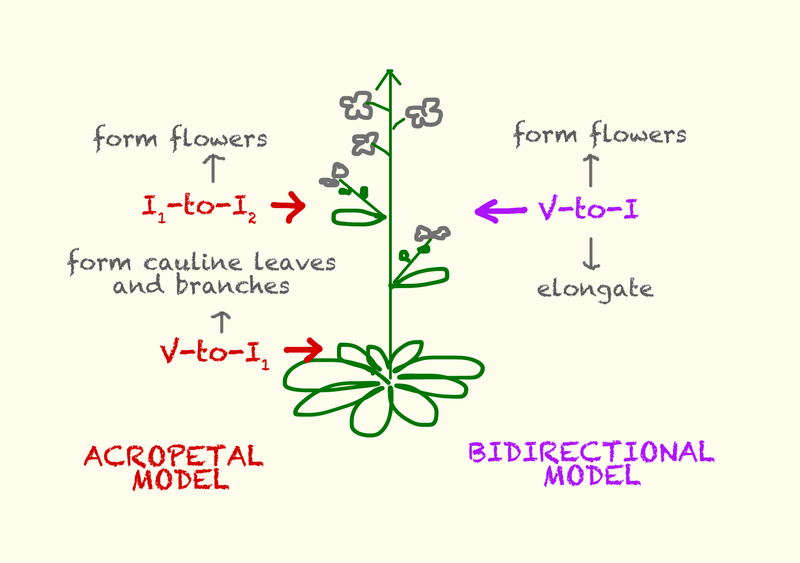 Alternatively, the bidirectional model proposes that there is a single transition (V-to-I), after which the I meristem produces flowers acropetally while promoting internode elongation and branch development basipetally (Hempel and Feldman, 1994). No definitive proof has been found yet that fully supports one model over the other. One of the consequences is that many studies consider rosette leaf number as an indicator of flowering time, while many others quantify total leaf number (rosette+cauline). While this dual biphasic behaviour seems to be a likely scenario, other interpretations could also be proposed that similarly fit the single-transition bidirectional model. It is possible that after GAs promote the reproductive transition, LFY action on GAs degradation could be local, restricted to acropetal lateral primordia, while basipetally GAs are not depleted from the stem and act on internode elongation. GA defective mutants would delay transition as a whole (explaining the increase observed in total leaf number described in Yamaguchi et al. paper) but then the basipetal signal to promote internode elongation would be weak and could explain the reduction on cauline leaf number of these mutants. In any case, in addition to food-for-thought, this work provides new and interesting evidence and further confirms our impression: transition to adulthood is also a hormonal matter. Blázquez M, Weigel D. 2000. Integration of floral inductive signals in Arabidopsis. Nature 404, 889-892. Gregis V, Sessa A, Dorca-Fornell C, Kater MM. 2009. The Arabidopsis floral meristem identity genes AP1, AGL24 and SVP directly repress class B and C floral homeotic genes. The Plant Journal 60, 626-637. Hempel FD, Feldman LJ. 1994. Bi-directional inflorescence development in Arabidopsis thaliana: Acropetal initiation of flowers and basipetal initiation of paraclades. Planta 192, 276-286. Ratcliffe O, Amaya I, Vincent C, Rothstein S, Carpenter R, Coen E, Bradley D. 1998. A common mechanism controls the life cycle and architecture of plants. Development 125, 1609-1615. Yamaguchi N, Winter CM, Wu MF, Kanno Y, Yamaguchi A, Seo M, Wagner D. 2014. Gibberellin acts positively then negatively to control onset of flower formation in Arabidopsis. Science 344, 638-641. This entry was posted in flowering, Uncategorized and tagged Cristina Ferrandis. Bookmark the permalink.